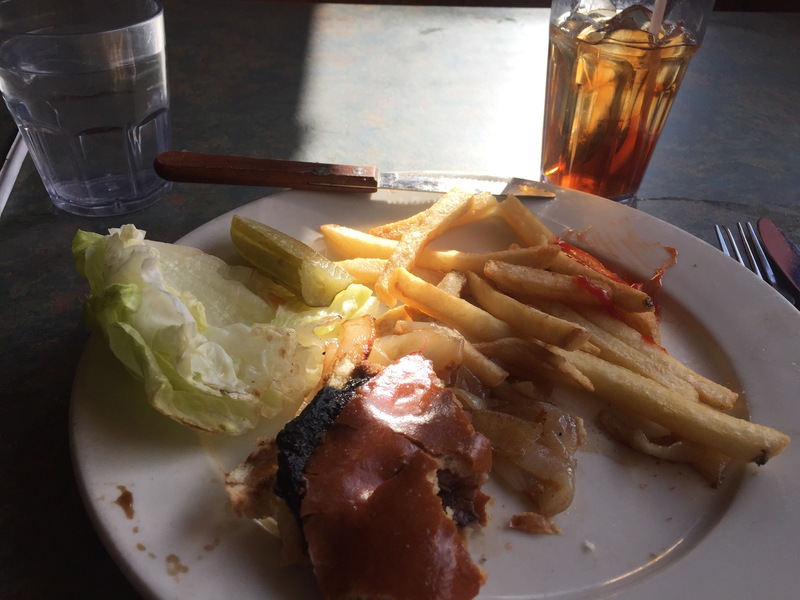 After my initial plan for revisiting Roki’s soon fell to waste (my 7 train stop did not stop for those heading towards Flushing), I went to Van Dam Diner and ordered a portabella mushroom burger (without cheese) deluxe, and an unsweetened homemade iced tea. The first order came to my table with cheese. I sent it back, but I understood their lack of detail, since the diner was very busy during the lunch hours. The waitress was super nice, which made the awkward situation much easier. She was a lifer; she probably began working there when she turned eighteen, and now she’s in her fifties. The second order, sans cheese, was perfect: the fat and flat mushrooms were piled with sautéed onions, with two thick slices of tomatoes and a lettuce leaf on the side, holding the sourest pickle I had in a long time. One golden onion ring grazed on top of the mountain of fries; both were crisply hot and freshly-done. This is one of the few dishes at the diner that was reasonably sized; most of the entrees are HUGE! I did almost finish my lunch today, but the muses were proving to be more substance than the food. Anyway, it was a good lunch indeed.